Florida Bay, edged by the "inner" curve of the Keys and the Florida mainland, is referred to locally as the backcountry, home to five of the most sought-after game fish among recreational anglers: bonefish, tarpon, permit, redfish (red drum) and snook. Off the Keys’ "outer" curve and nearby Gulf Stream lies the Atlantic Ocean. In these deep-sea areas are some of the greatest sport fish in the world: blue and white marlin, sailfish and swordfish. A widely practiced, catch-and-release approach balances preservation with recreation. Click to watch our whole series of fishing videos! For visitors, hiring a backcountry guide or charterboat and captain who knows Keys waters can make for a successful and educational day. Much can be learned from professional guides for whom "coaching" is an almost unconscious act. Vacation anglers will find comfort in a steady stream of advice and support from their captains, whose job is to give anglers shots at catching fish. Affordable backcountry and offshore charter fleets with expert captains can be found from Key Largo to Key West. A new Blue Star Fishing Guides program recognizes charter boat captains who are committed to sustainable fishing and educating their customers about resource protection in Florida Keys National Marine Sanctuary. The voluntary training and compliance program seeks to increase fishing guides' knowledge and, ultimately, that of their clients, to conserve the unique marine ecosystem of the Florida Keys. Tackle is specified as spin, fly, baitcast or conventional trolling gear with appropriate line class, or the breaking strength of a line, in pounds. 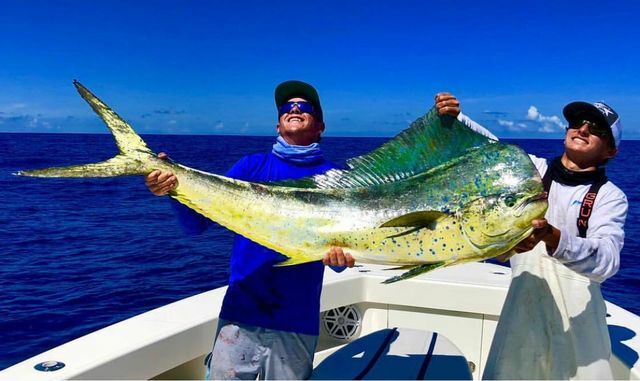 Light Tackle Fishing is the most flexible and almost any species is achievable: tarpon, sailfish, tuna, cobia, dorado (dolphin, mahi mahi), snapper, ceros and wahoo. Flats, Backcountry Fishing involves fly, spin or plug. Fish the flats on the Atlantic side or the backcountry, a region of uninhabited mangrove islands on the Gulf side, for tarpon, permit, bonefish, redfish, snook, sea trout, barracuda, jacks, sharks, and cobia. Deep Sea, Offshore Fishing is as close as five miles offshore, where the sea reaches depths of 600 feet — and by 17 to 20 miles out, depths in some spots can approach 2,000 feet to troll for blue marlin, white marlin, sailfish, spearfish, kingfish, dolphin, wahoo, tuna, barracuda, cobia, grouper, snapper, jacks and sharks. Wreck & Reef Fishing means you’ll find schools of permit, amberjacks, snapper, grouper and mackerel inhabiting the coral structures, patch reefs and crevices. You'll also find cobia, sharks, and barracuda. Bridge Fishing is a perfect place for anglers who want to "'wet a line" without a boat. Historic bridges along the Overseas Highway are noted fishing platforms, but a saltwater license is still required. Party Boats offer an angler a more economical means of enjoying a day of fishing, and boats usually run multi-day or full-day trips, often without reservations needed. A saltwater fishing license is required to fish independently in the Keys, even from area bridges or from shore. These can be purchased at many bait and tackle shops, online at www.myfwc.com or by calling 1-888-FISH-FLORIDA (888-347-4356) toll-free. Anglers fishing on a charterboat or backcountry boat do not need a license, however, as they are covered by the captain’s documentation.